With the ability to provide a total of 200 mA of power, Promira platform can easily power your project, simplifying connectivity and troubleshooting. With the I2C Active - Level 1 Application (licensed separately), I2C programming speeds are twice as fast as the Aardvark I2C/SPI Host Adapter. Featuring support for the I2C fast mode plus specification, Promira platform equipped with the I2C Active - Level 1 Application provides high speed I2C programming, high performance debugging, and superior emulation for your I2C protocol needs. With the I2C Active - Level 2 Application (licensed separately), I2C programming speeds up to 3.4 MHz for Master and Slave. Featuring support for the I2C High Speed Mode specification, Promira platform equipped with the I2C Active - Level 2 Application provides high speed I2C programming, high performance debugging, and superior emulation for your I2C protocol needs. 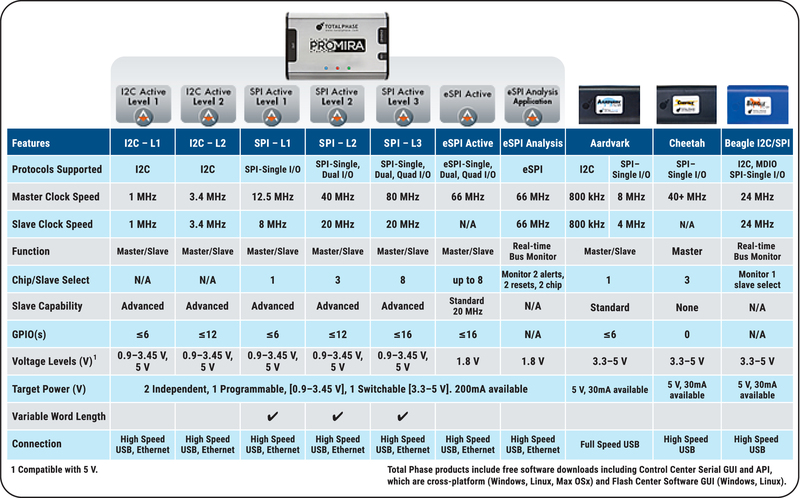 With the SPI Active - Level 3 Application (licensed separately), SPI programming speeds are even faster than before - supporting clock speeds of up to 80 MHz for master and 20 MHz for slave functionality, Promira platform equipped with the SPI Active - Level 3 Application provides fast programming, ultra-high performance debugging and superior emulation for your SPI protocol needs. The eSPI Active Example files also show you how to use your SPI Active licensed Promira Serial Platform to act as a master for the eSPI protocol. With the Advanced Cable Tester - Level 1 Application (licensed separately),you have the ability to do critical safety testing for Type-C and other USB cables, checking continuity, power handling, and E-Marker behavior. With the Advanced Cable Tester - Level 2 Application (licensed separately), you get everything from the Advanced Cable Tester - Level 1 Application, plus data throughput measurement at up to 12GBit/s. Signal Integrity tests all SuperSpeed and USB2 pairs to verify they meet the relevant specifications. Testing is done at 518 Mb for USB2, and at 5 Gb, 10 Gb, or even up to 12 Gb for SuperSpeed lines. With the A2B Bus Monitor - Level 1 Application (licensed separately), you will be able to non-intrusively monitor A2B communication. Multiple views provide information about A2B bus data (including I2C data, GPIO data, Interrupts), Node Topology, and I2S/TDM audio data and configuration. A Promira platform licensed with the A2B Bus Monitor - Level 1 Application is a compact solution excellent for bench top prototyping and in-vehicle field testing. All applications include one full year of software maintenance. As long as your software maintenance is current, you can take advantage of our five-star support. Any time you purchase a new application for your Promira Serial Platform, we'll automatically extend the software maintenance for all applications that have current maintenance support (applications that are out of support do not receive this benefit, so it's always best to keep the maintenance current on your applications). That means if you purchase one new application per year, all your applications will be eligible for software support. Don't worry - if your software support is about to expire, we'll let you know and you'll have the option of purchasing continued software support. 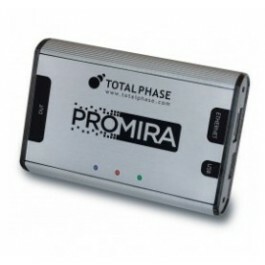 I Have the Promira Serial Platform – How Do I Best Capture SPI Data, Including Read/Write Errors? How Do I Set the Target Level Supply Voltage for an SPI Device for less than 3.3V using the Promira Serial Platform? How Can I Accelerate Results when Using Rapid Triggers to Read I2C Data? What Is the Safest Way to Power a Target 1.8V Device without Using an External Power? Which Mechanism and Tool Do I Need to Write to an SPI EEPROM? How Can I Best Update the Aardvark Software API to Promira Software API When I Need to Maintain Specific IP Addresses? Which Tools Work Best for Emulating I2C MDIO Signals? How Do I Increase Write Size to an I2C EEPROM when Using the Flash Center Software? How Do I Unlock the Write Protection to Enable Programming an SPI Quad Serial Flash Chip? How Much Power Can the Promira Serial Platform Provide to a Target System? How Can I Run Parallel Scripts with the Promira Serial Platform To Toggle GPIO During SPI Writes? How Do I Customize the Word Length Transmitted from an SPI Host Adapter? Which SPI Host Adapter Can I Use as an SPI Slave that Delivers a Large Enough Response for My Setup? I Am Working with SPI Flash Devices of Various Signal Levels and Power Setups - How Do I Control the Voltage and Signal Levels of the GPIO and Power Supply Pins of the Promira Serial Platform?